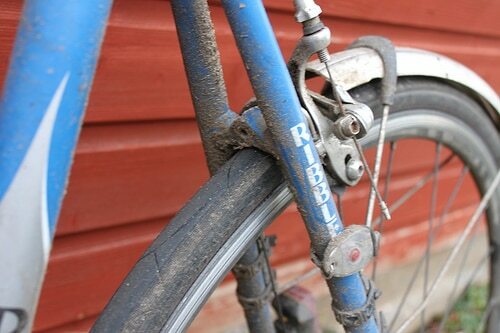 I’ve been using Specialized Armadillo road tyres for the past four – five years. In that time, I’ve only had one puncture, and that was a pretty big nail which would have puncture most tubs, tubeless and tyres. I use Armadillo’s on my commuting bike and sometimes on my training wheels for winter training. I know other people who have used them for a similar time and have either not punctured or just got the occasional puncture. An Armadillo in action on rear wheel of training bike. Winter grit and thorns seem to have no effect on the tyre. 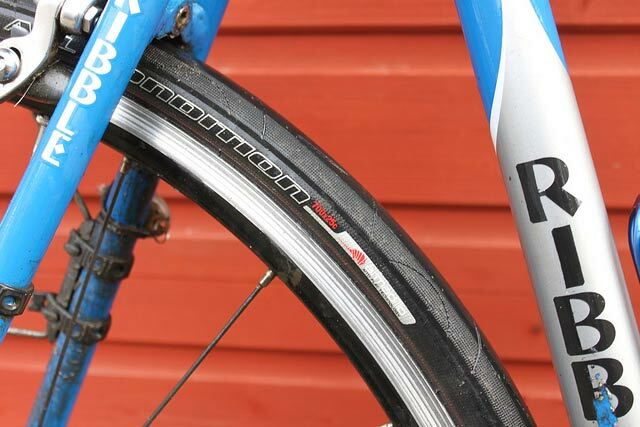 In summary, Specialized Armadillo are a very sturdy, strong and puncture resistant tyre. The inevitable downside is that they are heavier and with a poorer performance on rolling resistance. But, if you don’t mind some compromise in performance, you can get greater peace of mind and spend less time at the side of the road mending a puncture. This is important for the commute into town, where I don’t carry any spare inner tube or pump. They are not completely puncture proof. It maybe a tubeless tyre with self-sealing slime liquid offers an even better puncture resistance system. But with the Armadillos a puncture is going to be a very rare occurrence. This winter, I did ride quite a lot with a Specialized Armadillo on my front and rear training wheel. (I didn’t really plan to do this. It just kind of happened.) Now it is summer, I wouldn’t want to be riding an Armadillo whilst training. You feel there is some compromise in performance, and there are other lighter tyres which still offer very good puncture protection (e.g. the Continental GP and Gatorskin) Compared to a Gatorskin, the Armadillo feels slightly slower and a harsher ride. The Armadillo’s also seem to be much longer lasting than other tyres. My commute often involves a rough canal path and they haven’t needed changing for a long time. I think I’ve had my front tyre for nearly 3 years now. The back tyre needed changing after 2 years commuting. So even though they cost £30, they are good value. After three years, my front tyre is now looking tired and in need of a change it. Though I could probably get more use out of it, if I really wanted to. Grip isn’t really an issue on the commuting bike because I don’t go around corners at any speed. On the winter training bike, it feels fine. Though I prefer the 25 rather than the 23. Sometimes I worry the Armadillo is unforgiving and might slip from under you in the wet, but I haven’t had any bad experiences. The Armadillos’ are quite hard and rigid. I once got a paper cut trying to put it on. It’s not so supple. But overall it isn’t really a problem putting on. And once on, you can probably leave it there for 12-24 months. I have only used the road version of the Armadillo. However, Specialized have brought out a hybrid version – the Specialized Nimbus. Specialized say it is a ‘fast rolling, comfortable tyre for all roads and bike paths’. From what I can gather, it is essentially the same tyre technology with a different tread pattern. I don’t think the tread of tyres makes much difference. It’s not as if you can aqua plane while cycling. Perhaps if it it’s really muddy, the hybrid version may be slightly more appropriate. After testing other tyres, one tyre which offers perhaps even better puncture resistance to the Armadillo is the Schwalbe Durano Plus. It has a very deep puncture protection layer, which can absorb even drawing pins. I’ve had one Shwalbe Durano Plus on one wheel and it never got a puncture at all. The Shwalbe is a little heavier than the Armadillo. 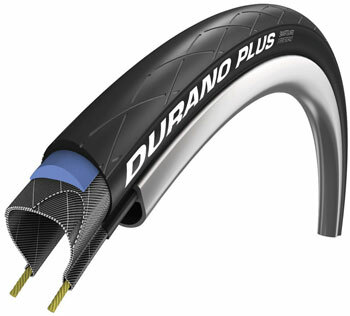 If you really want to maximise puncture resistance you may get better results with the Schwalbe Durano Plus. However, because I’ve been using Armadillo’s for 4-5 years, I have developed a certain attachment to them. If it ain’t broke why fix it? Or in the case of Armadillo’s – if they don’t puncture, that’s all you ask of a winter commuting tyre. I’ve had three punctures with Armadillo Elite (AE) in around 40000km of riding. One was the very first ride with them brand new two miles from home and just bad luck. The other two were after the TWIs were long gone and I’d not got around to fitting the new tyre – so I consider those my fault. I do 45km of commute per day and so really like to avoid punctures and on the success so far with the AE currently wouldn’t be bothered with anything else. They leave me feeling like a broken record every time friends are babbling about their latest punctures and I just give them the updated mileage I’ve done without getting any punctures. They still by their 80-120g lighter tyres that they are attached to instead and continue getting punctures.